Rublev Colours Oil Medium No. 2 is mixture of linseed oil, purified and thickened by exposure to sunlight and air until it pale and viscous, and pure spirits of gum turpentine. This medium dries the fastest of the three linseed oil mediums. As the linseed oil dries naturally, containing no driers or resins, it may be used with confidence as to its future behavior and longevity. 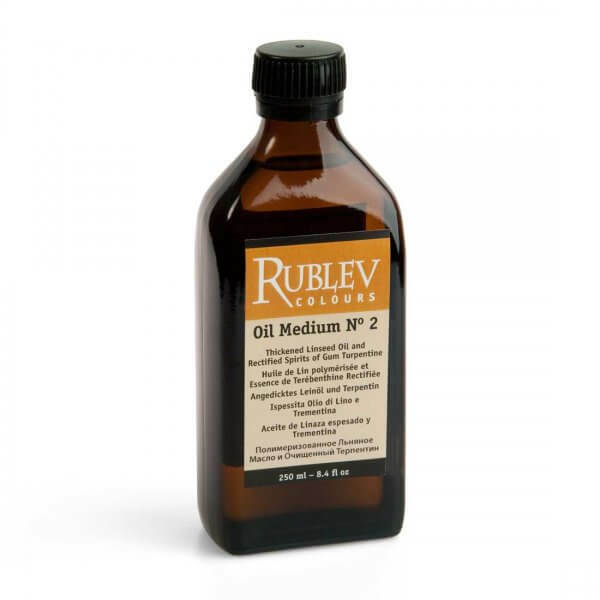 Use as a painting medium, for "oiling out" to keep oil colors fresh and as a safe drying oil mixed with oil colors on the palette. WARNING! Contains Turpoentine. Avoid eye and skin contact. Avoid long exposure by inhalation. Do not take internally. Use with adequate ventilation. Keep out of reach of children. Conforms to ASTM D 4236 health requirements. Flammable Material: Cannot ship by air. Ships only ground or by special postage within the contiguous 48 states of the United States.